Integrated communications firm Imagination, based in London, has a reputation for producing experiential and effective brand marketing using the latest in digital lighting technology and recently turned to Martin Professional’s award-winning Exterior 400 Range of LED luminaires to illuminate its own headquarter façade. As a creative company with an understanding of how to produce attractive visual solutions that add value for clients, it was only natural that Imagination would want its headquarters to reflect that dynamic character. Imagination’s headquarter building lies in the heart of London’s West End. It is a multi-use, award-winning facility with a visually attractive façade that has been illuminated for years in a pleasing shade of blue, a color scheme that the company wished to keep. Yet an upgrade to more dynamic and energy-efficient luminaires was called for. “We wanted to maintain the previous classic blue lighting scheme on the building, which was HMI lighting and which we’ve had for quite some time, but we also wanted the ability to do different lighting schemes, for example at Christmas,” states Imagination’s Mike Sobotnicki who headed up lighting design on the project together with Imagination project manager Paul Scott. Imagination is well acquainted with the Martin Exterior 400 Range, having previewed the luminaires at Martin’s headquarter facility in Denmark. They have also incorporated the fittings into some of their designs including lighting for Disney cruise ships. On the Imagination project, the fixtures are mounted along the building façade on metal brackets, approximately two feet below ground level. The Imagination building houses more than just work areas for Imagination staff however. A number of other spaces, including the Imagination Gallery, a unique, purpose-built event space, can be used by clients for special events. An important aspect of the lighting design therefore was the ability to serve client needs by changing the mood of the front of the building to suit various activities. 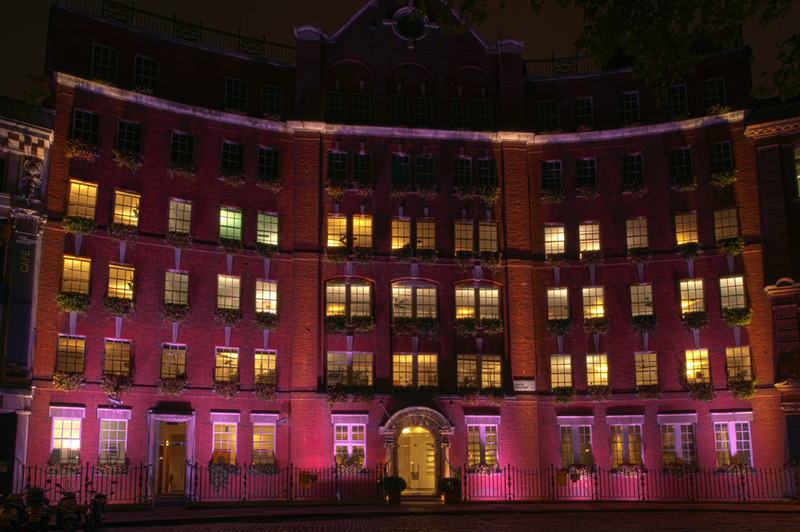 “We also have external clients who can rent space in the building and we wanted to provide them the flexibility to choose a lighting scheme - the colored illumination system provides that. The façade, as well as the indoor spaces throughout the building, represents a blank canvas that clients can use to brand their event and in effect make the building theirs,” Sobotnicki says. The color-changing Exterior lighting fixtures also allow Imagination to show their festive spirit by lighting the façade in themed colors during holidays. Twelve Martin Exterior 410s™, an RGBW color mixing fixture with pre-mixed LEDs, provide a wash of color across the façade, an ideal luminaire for installations like the Imagination building in which the projection distance is short. Working with the Exterior 410s are four Exterior 420s™, a powerful white light unit with the flexibility of color temperature control. The new lighting installation made its debut in September of 2011 and has reportedly been very well received by staff and clients alike.